If you could sum up the history of Christianity in India in one word, that word would be ingratitude. Among the earliest refugees to arrive in India were the Syrian Christians, who were facing persecution in their native lands in the Persian Empire in the fourth century CE. Shahpur II deported some Christians from his Eastern Syrian province and imposed a double tax on those that remained. The Christian subjects were then ordered to revert to their native Zoroastrian religion. Down on their luck, the Syrian Christians sought refuge in India. Kerala’s Malabar coast attracted them because they had heard of an ancient community of Jews who had been living there since the first century CE, having also fled the turmoil of the Middle East. How were these Syrian Christians—or Nasranis as they are still called by the locals—treated? “The Indian king received them with great kindness,” George David Malech writes in History of the Syrian Nation and the Old Evangelical-Apostolic Church of the East. In fact, around the time (1498 CE) when the Portuguese marauders led by Vasco Da Gama arrived in Malabar, the Syrian Christian community was thriving, with at least 30,000 members. Now, here’s how they repaid India’s generosity. 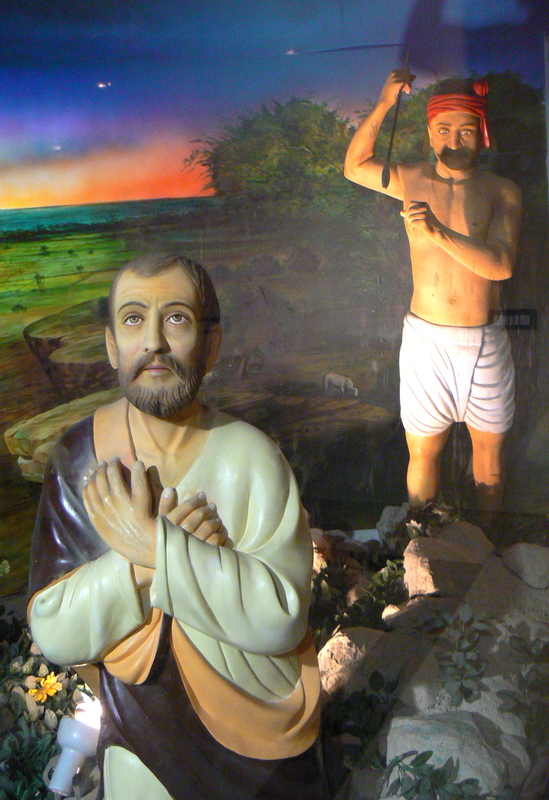 When Da Gama returned for the second time in 1502, he was met by a delegation of Syrian Christians: “They identified themselves, surrendered their ancient honours and documents, and invited him to make war on their Hindu king,” writes Ishwar Sharan in The Myth of Saint Thomas and the Mylapore Shiva Temple. Subrahmanyam continues: “In the same context, he hence offered the aid of the Syrian Christians as an auxiliary military force, to aid the Portuguese, claiming that they represent ‘over 25,000 warriors.‘” The bishop requests Vasco Da Gama to intercede—that is use military force—on behalf of the Syrian Christian community. Mar Jacob also proposed the construction of a Portuguese fortress at Cranganore, a proposal that was put into effect a decade later, in 1536, paving the way for the Portuguese colonisation. However, once they had cynically used the help of the traitorous community, the fanatic Portuguese persecuted the Syrian Christians with a vengeance, and forced them—on pain of death—to abandon their ancient Orthodox church and swear allegiance to Roman Catholicism. The history of Kerala Christians—who today comprise around 20 per cent of the State’s population—hasn’t exactly been exemplary in modern times. In the early 1970s when Prime Minister Indira Gandhi was publicly denouncing the threat of CIA subversion of India, the US ambassador in New Delhi, Daniel Patrick Moynihan, ordered an investigation into the matter. Just like the Syrian Christians backed their western co-religionists over the local Hindu and Muslim communities, with whom they had co-existed—and from whose help they had thrived, prospered, and gentrified—modern Indian Christians look up to the West, especially the United States. In their view, America, being the most Christian nation, should help them in keeping India—and thereby Hindus—in line. However, not content with the creation of Pakistan, the Christians “denounced and condemned the unfair distribution of Punjab province more forcefully even than the Muslims and tried their best to get the districts of Pathankot and Gurdaspur included in western Punjab”. Are Christians a fifth column? John also saw a divine connection between attacks on Christians in Orissa and the cyclone that hit the region in December 1999, killing 10,000 people. This is nothing but vicarious pleasure at the expense of non-Christian Indians. He wasn’t the only one expressing such sentiments. The tsunami in India—in which 10,136 people were killed and hundreds of thousands made homeless—was indeed a windfall for many American Churches which poured in billions of dollars to convert large numbers of poor fisher folk in the Kudankulam area. Ten years later, these converts were unleashed against the crucial Kudankulam atomic power plant. In 2014, the Intelligence Bureau (IB)—India’s premier internal security agency—submitted a report to Prime Minister Narendra Modi, identifying several foreign-funded NGOs that are “negatively impacting economic development”. The IB report neatly ties in with former Prime Minister Manmohan Singh’s claims that NGOs funded by the Americans were leading the protests against the Russian-built nuclear reactors in Kudankulam. That the maddeningly taciturn Singh would speak out—despite owing his prime ministership to his party boss, the pro-Christian and Catholic Sonia Gandhi—is an indication of the danger posed to India’s national security by forces being remote-controlled by the West. The NGOs that were at the centre of the mass protests were associated with Bishop Yvon Ambroise, the Tuticorin Church leader, who had been active in the vicious campaign against the power plant. In fact, there is evidence that the earliest Christian converts from Hinduism betrayed Indian interests. It also illustrates how Christians are easily coerced by their western masters. The point is not the betrayal by newly converted Indian Christians. To be sure, they had—albeit naively—asked the European priest to keep the secret to himself. The point is that this is exactly how Indian Christians can be used by their western masters. For instance, pressure can be applied on the family of a seemingly loyal Indian Christian who is, say, a rocket scientist at the Indian Space Research Organisation. Pressure can come in a variety of ways but the most likely approach a western intelligence agency would take is to first approach the Christian scientist’s parish priest via the local bishop, who may be approached through someone in the Vatican. Parish pressure is no joke. Hindus, who do not formally congregate under a priest, cannot understand how closely integrated the Church is with the families of local Christians in a particular area or parish. When this writer was studying in St Thomas College, Thrissur, Kerala, he was witness to priests, some of who were lecturers, demanding to know why a particular student had skipped Sunday mass. Under such circumstances, transferring national secrets into a pen drive and handing them to an agent of a western intelligence agency might seem like a small inconvenience. To be sure, individual Christians in high-level positions may not be predisposed to betrayal. But because the entire Christian ecosystem is geared towards complete control of its flock, it’s unlikely many of them can stand the immense pressure brought to bear on them and their families. As Subrahmanyam writes, the Portuguese looked at Syrian Christians as a means to get “political and economic mileage”. Similarly, today’s Indian Christians are a means for the West to penetrate the higher echelons of power in New Delhi. Some argue the caste system in Hinduism is unfair to the lower castes and hence Christianity can lift them by treating them as equals. That’s probably the lamest argument in favour of the Abrahamic faith. For, if Christianity has not made, say, Europeans or Americans, better human beings, what makes them think it will make Indians any better? First up, racism is at all-time high levels in the West. American Christian Churches quoted the Bible to give approval to the slave trade. Today, black Christians are again being lynched by white Christians in America. What can they teach India about equality? Also, despite the horrendous bloodshed of two world wars, these Christian nations are still at each other’s throats and still bombing innocent civilians around the world. And if events in Ukraine are any indication, European Christians haven’t learnt anything at all and are creating a situation that could lead to World War III. At any rate, caste schisms among Indian Christians mirror the caste divisions in Hinduism. “Conversion to Christianity does not seem to eradicate caste prejudice in India any more than it eliminates racial discrimination in the US. Despite Jesus’ call for brotherly love, isn’t Sunday the most segregated day in America?” writes C. Alex Alexander, a naturalised US citizen and former Chief of Staff, US Department of Veterans Affairs in a detailed expose of the Christian threat to India. Religious conversion is therefore a flick of a switch that transforms an Indian—or for that matter any follower of a native religion—into an extension of western culture and influence. What does this mean, in practice, for a targeted country? It is well-known that Indian Christians in cahoots with fundamentalist American politicians, Church groups and Indian Marxists played a leading role in getting Prime Minister Narendra Modi banned from entering the US for his alleged role in the 2002 Gujarat religious riots. However, Christians have been working against Indian interests even prior to that. In September 2000 when Prime Minister Atal Bihari Vajpayee was in the US on an official visit, Christian fundamentalist John Dayal appeared before the US Commission on International Religious Freedom (USCIRF) in Washington DC. Outwardly, Christianity might appear to be a benign religion. Indeed, when compared with the aggressive face of Islam, it definitely appears to the tamer Abrahamic sister. In “Why Christianity Failed in India,” Tony Joseph writes in Outlook magazine that after 2000 years of trying to convert India, Christians form just around 2 per cent of the population. However, he misses the point entirely. Christianity did not grow much during the centuries preceding the period of European colonialism because the early Christians were refugees and not keen on converting native Indians. Again, during the colonial period, when hordes of missionary Europeans waded into India, the pace of conversion failed to pick up because Indians knew who the enemy was—Christian Europeans, who came to destroy Indian civilisation just as they destroyed Native American and Australian Aboriginal cultures. Today, the Europeans are gone but their agenda remains. Where earlier you could spot a Christian or evangelist by the colour of their skin, now they are in our midst. They have names like Mahesh Bhupathi, whose mother once said, “My burden is for India, since in this country we fight with about 33 million other gods.” Had she not uttered those tasteless remarks, nobody would have been the wiser to her and her son’s proselytization activities. Under the cloak of democracy, Christian missionaries can sneak in and conduct their unholy work among the poor and helpless. Christian churches have cropped up like a rash across the east coast after the tsunami hit southern India. Nagaland, which was entirely animist, despite two centuries of British rule, became 100 per cent Christian under 50 years of democratic—or rather Nehru-Gandhi dynasty—rule. Christianity has not—yet—failed in India. With powerful backers in the West, it is preparing for another big harvest. While visiting India in 1999, the Pope openly proclaimed his wish to “witness a great harvest of faith” there through the Christianisation of the entire country. Predictably, it led to a backlash from Hindus who felt threatened—and betrayed—by the huge crowds of Indian Christians who turned out to greet the Pope. Christian leaders and organisations in sync with western NGOs and Church backed bodies are playing a divisive game aimed at breaking India. Author Rajiv Malhotra has exposed this with abundant evidence in the book Breaking India, which he co-authored with Aravindan Neelakandan. According to Malhotra, US and European churches, academics, think-tanks, foundations, government and human rights groups play an aggressive role in fostering separation of the identities of Dravidian and Dalit communities from the rest of India. Seeing how the nativist movement in the Americas is partly directed against Christianity because of its historical aggression against native society (in spite of Liberation Theology’s attempts to recuperate the movement), the Indian Church tries to take over this nativist tendency and forge it into a weapon against Hinduism. Christian involvement in the so-called Dalit (“oppressed”) and Adivasi (“aboriginal”) movements is an attempt to channel the nativist revival and perversely direct it against native society itself. It advertises its services as the guardian of the interests of the “true natives” (meaning the Scheduled Castes and Scheduled Tribes) against native society, while labelling the upper castes as “Aryan invaders”, on the basis of an outdated theory postulating an immigration in 1500 BC. Elst adds: “To declare people ‘invaders’ because of a supposed immigration of some of their ancestors 3500 years ago is an unusual feat of political hate rhetoric in itself, but the point is that it follows a pattern of earlier rounds of Christian aggression. It is Cortes all over again: Cortes, the conqueror of Mexico, could defeat the Aztecs, the ruling nation which had immigrated from Utah three centuries earlier, by enlisting the support of nations subdued by the Aztecs, with himself posing as their liberator (of course, they were to regret their ‘liberation’). The attempt to divide the people of a country on an ethnic basis—whether it is a real ethnic distinction as in the case of Cortes’ Mexico, or a wilfully invented one as in the case of India—is an obvious act of hostility, unmistakably an element of warfare. » Rakesh Krishnan Simha is a New Zealand-based journalist and foreign affairs analyst, with a special interest in defence and military history. He is a columnist with the Rossiyskaya Gazeta group, Moscow, and Modern Diplomacy, a Europe-based foreign affairs portal.